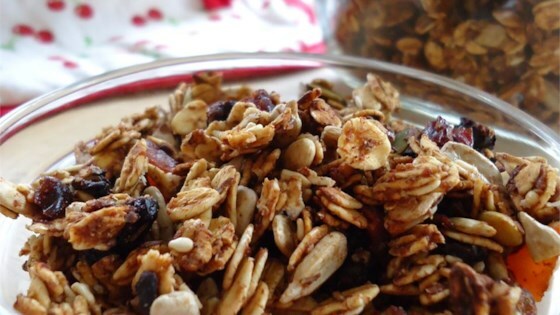 "After searching for a healthier granola recipe, I tweaked a few to lessen the sugar. I use seeds instead of nuts due to allergies. Still very crunchy, delicious, and satisfying! Change the dried fruit to fit your tastes (blueberries, cherries, cranberries, apricots, etc.)." Combine oatmeal, sunflower seeds, pumpkin seeds, sesame seeds, flax seeds, wheat germ, chopped dried cherries, salt, and cinnamon in a large bowl. Mix applesauce, maple syrup, and vanilla in a separate bowl. Pour applesauce mixture over the oatmeal mixture; mix until evenly coated. Spread the mixture onto the prepared baking sheets; smooth into a single thin layer. Bake in preheated oven 20 minutes, stir gently to turn, and continue cooking until crisp and golden brown, another 15 to 20 minutes. See how to make your own granola from scratch. I would suggest buying unsalted seeds if you can. Just made this and it was way too salty. I had to add brown sugar after the fact, but still too salty. Next time I will know better.